This Personalized Map Puzzle is a superb 400-piece jigsaw puzzle featuring your own home as the centerpiece! Each map puzzle is extracted from the US Geological Survey and is a personalized gift truly hits home ! These personalized jigsaw puzzles are individually created using high-quality, full-color mapping extracts which include, among other fascinating details, named main roads, contour lines, transport infrastructure, water features, vegetation and show notable buildings and structures – all centered on your address! The personalized map puzzle covers an area 6 miles East-to-West and 4 miles North-to-South with your house in the center! The result? A truly unique jigsaw map puzzle that will certainly draw on your local knowledge and make exciting and unusual gifts for anyone in America. Your jigsaw will arrive in an attractive presentation box which - for an added personal touch - contains an area on the box lid allowing you to write your own personalized special gift message to the recipient. To help you get started “putting the neighborhood together,” the centerpiece is shaped like a house! Each jigsaw puzzle is individually made-to-order using quality 1.5mm Millboard and hand-finished by our expert craftsmen. Assembled size: 121/4 x181/2 inches. NOTE: Only U.S. addresses are available for this map puzzle at this time. The map base used for the jigsaws is taken from the US Geological Survey Mapping which unfortunately is the only seamless mapping available in the US, which enables us to site centre zip codes to produce the puzzles. This data does vary from location to location, and can in some rural areas be 15+ years old. 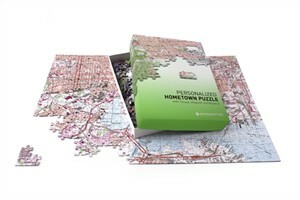 Availability: This Personalized Hometown Map Puzzle is made to order and takes approximately 3 weeks to leave the warehouse plus transit time. Please note this item does not ship express. Please choose a standard shipping method as your shipment option..